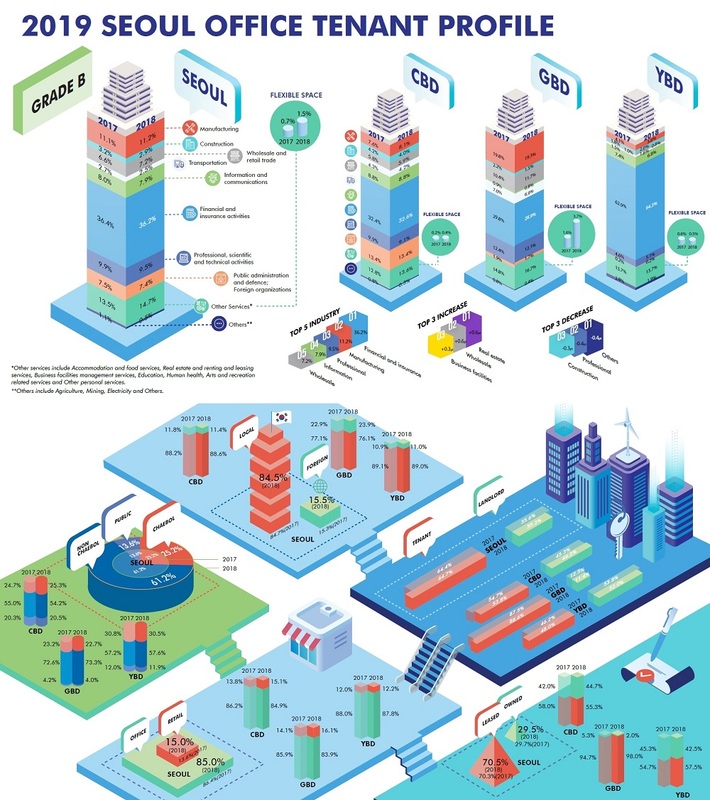 CBRE Korea, announced that according to its 2019 Seoul Office Tenant Profile report, the proportion of leasable space in Grade A office buildings in Seoul’s three major business districts increased by 4.7%pt y-o-y in 2018, to 80.9%. The proportion of leasable space in the overall office market increased by 2.4%pt y-o-y, to 68.9% owing to numerous cases of owner-occupiers disposing of headquarters buildings. 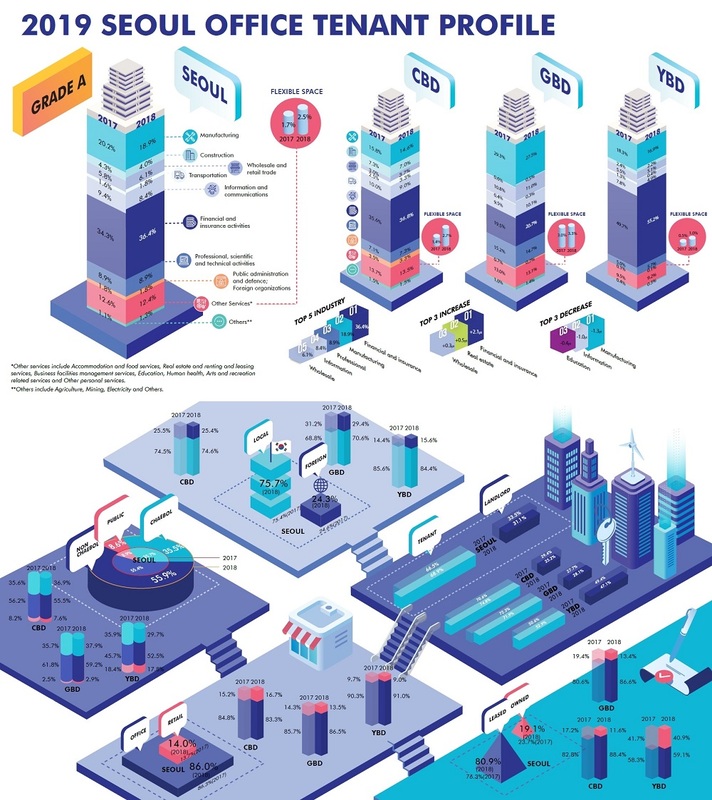 The proportion of Grade A office space in Central Business District (CBD) and Gangnam Business District (GBD) occupied by conglomerates increased by 1.4%pt y-o-y and 2.2%pt y-o-y, respectively, in 2018 while the figure for the Yeouido Business District (YBD) declined by -6.2%pt y-o-y due to several major companies relocating from the district. The proportion of space occupied by finance and insurance sector companies was 36.4%, the highest among all sectors. It increased by 2.1% y-o-y, driven by a 5.5%pt y-o-y rise in the YBD. Approximately 15% of space in Seoul’s Grade B office buildings was allocated to serve retail functions in 2018, a rise of 1.3%pt y-o-y. The increase reflects landlords’ continued attempts to reduce vacancy arising from flight-to-quality relocations, with converting lower office floors to retail remaining a popular strategy. Flexible office operators occupied 2.5% of Grade A office space by the end of 2018, an increase of 0.8%pt y-o-y. Their presence was highest in the GBD, at 3.3%, and CBD increased 0.7%pt y-o-y which led in terms of growth. Flexible office operators also added to their Grade B office footprint in 2018. Flexible offices, which accounted for 0.7% of Grade B office space in 2017, occupied 1.5%, an increase of 0.8%pt y-o-y in Seoul at end of the year. For more information about the Seoul commercial property market email Claire Choi, Head of Research at CBRE Korea via the contact details below.